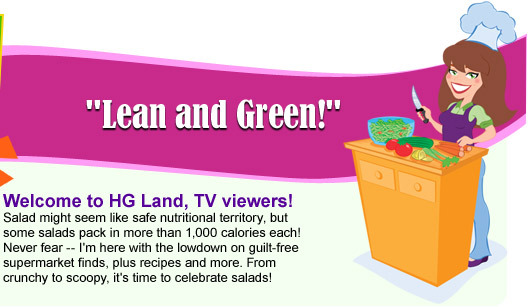 home > episodes > Lean and Green! So decadent and creamy, it's hard to believe a serving has only 2 grams of fat. Believe it, baby! This is my all-time favorite salad. Hence, the name. It's loaded with so much goodness, it doesn't even need dressing! Restaurant versions of this salad sneak in way too much fat and too many calories. Mine tastes just as good and is just as large, but it's totally guilt-free. Hooray! Scoopable Salad Essentials - Trade in the full-fat mayo for some mustard-infused Hellmann's/Best Foods Dijonnaise. Just 5 calories per teaspoon, and it's super-flavorful. Then add lots of veggies for bulk. I'm also a huge fan of albacore tuna and pink salmon packed in water, especially the pouches -- no can opener or draining involved! Dressings & Dressing Swaps - I LOVE spray dressings, like the kinds by Wish-Bone and Ken's. It's difficult to overdo it with the sprays, and they have only 1 to 2 calories per spray. So spritz away! I've been known to bring a bottle in my purse to restaurants. I also love using fresh salsa as a salad dressing -- it's fat-free and adds tons of flavor! And try mixing low-calorie BBQ sauce with some fat-free ranch dressing for a cool 'n zesty twist! 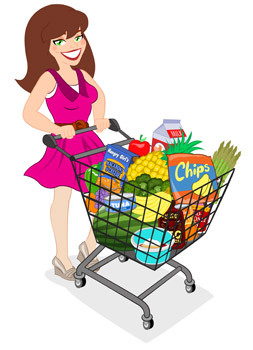 Salad Toppers - I love to pile my salads high with guilt-free goodies like canned beans (a few tablespoons go far), sweet corn kernels, sliced beets, fat-free shredded cheese, and even crushed low-fat baked tortilla chips (like the kinds by Guiltless Gourmet) for some crunch! Who needs fatty croutons anyway? 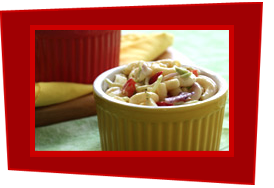 Creamy Dreamy Macaroni Salad - This scoopy pasta salad is creamy, crunchy, and delicious. And it has only 126 calories and 1 gram of fat per serving. Eat it! Sweet 'n Chunky Chicken Salad - My version of the fattening Waldorf salad will rock your world. Guaranteed. Chompable Chinese Chicken Salad Wrap - This handheld salad is so fantastic, ooohs and aaahs are sure to ensue. Hot & Cold 10-Veggie Explosion - LOOK! It's a sneak peek at the "BIG Salads" chapter of the brand-new HG cookbook, Hungry Girl 300 Under 300: 300 Breakfast, Lunch & Dinner Dishes Under 300 Calories! Click here for the names and photos of all the recipes in that chapter. Freshly Picked Salad Recipe Roundup - Here are FIVE more amazing plates of greens!